"An enthralling and profoundly humane book that every civilized person should read." When did people first start to wear jewelry or play music? When were cows domesticated, and why do we feed their milk to our children? Where were the first cities, and what made them succeed? Who developed math--or invented money? The history of humanity is one of invention and innovation, as we have continually created new things to use, to admire, or leave our mark on the world. In this groundbreaking book, Neil MacGregor turns to objects that previous civilizations have left behind to paint a portrait of mankind's evolution, focusing on unexpected turning points. Beginning with a chopping tool from the Olduvai Gorge in Africa and ending with a recent innovation that is transforming the way we power our world, he urges us to see history as a kaleidoscope--shifting, interconnected, constantly surprising. 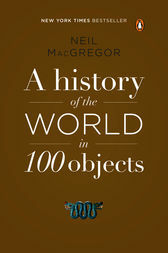 A landmark bestseller, A History of the World in 100 Objects is one f the most unusual and engrossing history books to be published in years. Neil MacGregor has blazed an unusual path to international renown. As director of the British Museum, he organized an exhibit that aimed to tell the history of humanity through the stories of one hundred objects made, used, venerated, or discarded by man. The exhibit and its accompanying BBC radio series broke broadcasting records and MacGregor’s book became a bestselling sensation on both sides of the Atlantic. He is also the author of Shakespeare’s Restless World.